I went and saw SIMO at VZD's on Saturday. Great show. If you get a chance, go see them. This is audio only and definitely worth a listen. The link to the stream is included in the story. At this point, some 47 years after Jimi Hendrix' death, it's probably unrealistic to expect that a set of deep-vault studio tracks can expand the guitarist's legacy in any meaningful way. This no doubt dismays the Hendrix obsessives, who pine for the long-whispered-about radical experiments they believe Hendrix squirreled away in some Electric Ladyland broom closet. For the rest of us, the arrival of any sort of Hendrix material, especially if it's captured in the studio, is a chance to be awed, all over again and in surprising ways, by this human's freakish powers of musical persuasion. No rock figure before or since could breathe fire like Hendrix does, on his beloved well-known albums and on the assortment that is Both Sides Of The Sky. Even when he's playing the well-worn heard-it-a-zillion-times blues like the opening track "Mannish Boy." Even when he's dropping an over-the-top theatrical solo on his original "Hear My Train A-Comin'" that alternately celebrates and shatters blues tropes. Johnny Cash: Forever Words is available now. The 16-track record is a follow up to the 2016 book of the singer's poems, Forever Words: The Unknown Poems and includes stirring vocal performances from Elvis Costello, John Mellencamp, Brad Paisley, Willie Nelson, Alison Krauss and more. The man who brought the words and musicians together is Johnny and June Cash's son, John Carter Cash, one of the record's producers. Not sure you can pigeonhole these guys into one genre. A little Rock & Roll, a little R & B, and a little Americana, but they are different and pretty talented. I hope others from the OP family had a chance to see the Eagles tonight at the BOK Center in Tulsa. It was strange without Glenn, but his son Deacon did a fantastic job. It also never hurts to have Vince Gill in your band. What a concert. When they started the show with "Seven Bridges Road", you knew it was going to be great. The harmonies were the same as ever. Check out Sunny War and The Marcus King band. Whether it truly stirs one's chili or not, there is no denying his genius. Aug. 1, 1981, might not immediately come to mind as an important date in history, but to a generation of music fans, it was monumental. On that day, 37 years ago, a cable TV channel that played music videos around the clock made its debut. It's funny to think about now, but there was a time — for about the first decade of the channel's existence, really — when the M in MTV actually mattered. Sure, plenty scoffed at the concept of a radio station on TV — built on a new art form, the music video. But to young GenXers, it quickly became after-school appointment viewing. Part of MTV's impact — for better or worse — was that it transformed music into a multi-sensory medium. It wasn't enough to sound good; suddenly bands had to be hypersensitive to their visual image — whether that meant shooting videos in Sri Lanka, a la Duran Duran, or playing up their oddball looks, such as ZZ Top. But of greater importance to musicophiles was that MTV suddenly provided an important outlet for new music. Radio at the time was largely programmed by Baby Boomers, but MTV broke new and more cutting-edge bands. That's because few music videos even existed at launch. The form had already taken hold in Britain, so much of MTV's initial inventory consisted of new wave bands from across the Atlantic — the Buggles' Video Killed the Radio Star was the first video shown; others in early rotation included Squeeze, Roxy Music, ABC, Culture Club and plenty of other acts who otherwise wouldn't have found much of an audience on U.S. soil. MTV later went on to develop non-music programming, and the Internet eventually became the outlet of choice for music videos. But thanks to the Internet, we can all relive the music of Aug. 1, 1981. Yes, someone has put together a Spotify playlist called "MTV: First 24 Hours." Bless you, Sarah Jayne Gipson, whoever you are. Feel old yet? I had just turned 13 and remember it like it happened yesterday. Completely changed music for me. R.I.P. Aretha Franklin, Queen of Soul, awesome voice! 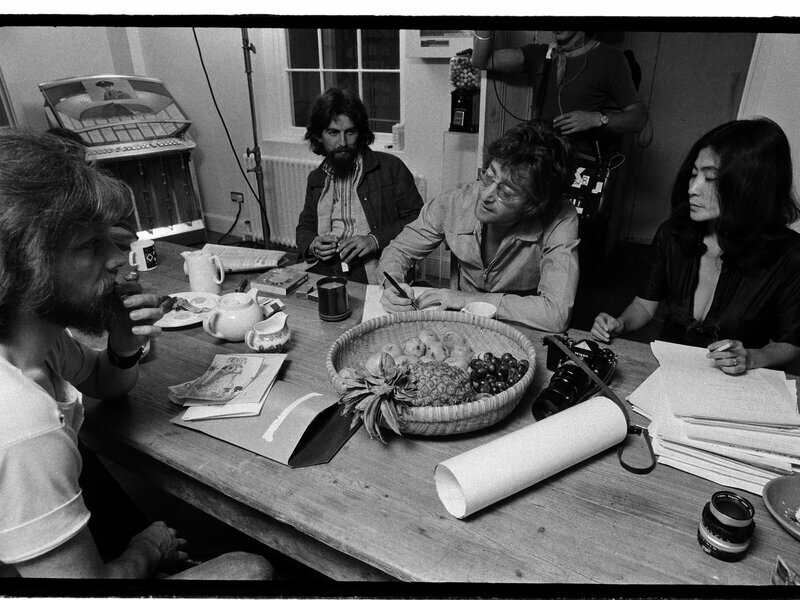 Pictured from left to right: Alan White, George Harrison, John Lennon, and Yoko Ono. Bohemian Rhapsody like you have probably never heard it.